Educator may need to add explanation/scaffolding to some of the mathematical terminology used depending on background level of students. Activity is probably best used in sequence with the other 4 activities in the What is the Future of Earth's Climate? module; [link http://authoring.concord.org/sequences/47]. Although some scaffolding is provided with understanding anomaly graphs, educator may need to spend more time unpacking this concept. Educator will need to unpack the IPCC scenarios. Activity draws on NASA data, showing temperature changes over the past 120 years, and data from the Vostok ice core to look at climate trends over different time scales. 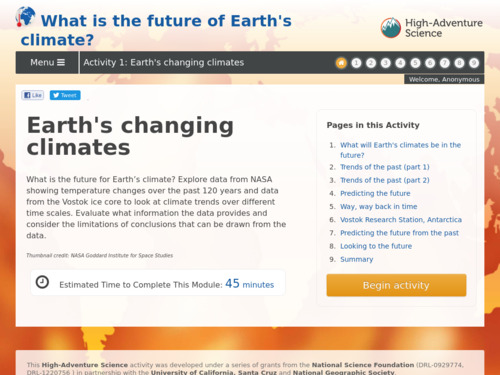 Activity is the first of 5 activities in the High Adventure Science module, What is the Future of Earth's Climate? Activity does a good job of explaining elements of the visualizations to students (such as running mean, annual mean, baseline error bars) and then poses questions to which students respond online, generating a report of the questions and their responses at the end of the activity. The High Adventure Science website [link http://has.concord.org] has supportive instructions and information for teachers. If teachers register their classes through the portal provided, they can access students answers to questions and other data. Excellent quality and easy to use. All aspects of the lesson including the data tools and fill in answer boxes provide seamless experience for students.